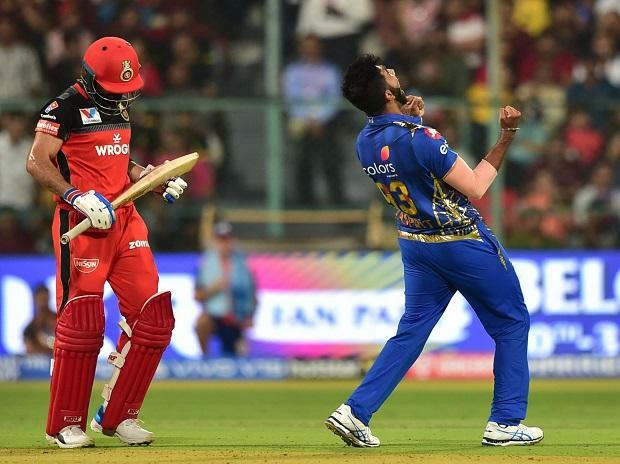 A furious India and Royal Challengers Bangalore captain Virat Kohli asked umpires officiating in the IPL to keep their "eyes open" after a "ridiculous" no-ball howler cost his side dearly, something which was also acknowledged by rival Mumbai Indians captain Rohit Sharma. Both Kohli and Rohit criticised the umpiring standard during the match which was won by Mumbai Indians by six runs on Thursday. RCB needed seven to win the match and Lasith Malinga's delivery to Shivam Dube -- a full toss- was a no-ball which was missed by the on-field umpire S Ravi. The TV replay showed that the bowler had overstepped and a free hit should have been awarded. Had it been a free-hit, AB de Villiers, batting on 70, would have faced it and the RCB could have won the match. Rohit was also critical of the umpiring standard during the match. "Honestly, I just go to know after crossing the rope that it was a no-ball. These kind of mistakes aren't good for the game. Wining and losing does not matter. It (mistake) is not good for the game of cricket, as simple as that," the MI captain said. "Those sort of mistakes have to be avoided. If we (players) make mistakes, we pay for it. So, it is not good for the game. Eventually, the game will start moving in different direction if these things (umpiring mistakes) keep happening," he said at the post-match press conference. He urged the umpires to be more careful about these kind of decisions in future. "You know that the decision factor is very very important. Those crucial decisions can change the game, whether it is a wide, a no-ball. So, we just have to be more aware of it, as simple as that. Next time, probably, they (umpires) will be more careful about those kind of decisions," he added. Rohit also talked about another incident of umpiring mistake during the match. This time, his team was at the receiving end. "The over before that Bumrah bowled, a ball which wasn't a wide but it was called," Rohit said, referring to a decision given by other umpire, C Nandan. Talking about the match which his side lost, Kohli said he committed a mistake by trying to take on Bumrah. "We should have done a better job with the ball after they were seven down. The last few overs were brutal for us. Bit of a mistake from me to take Bumrah on at that time. Bumrah makes a hell of a difference in any team," the RCB captain said.